Table 301 Bistro – Website Development | ASTRALCOM - Content Strategy, Conversion Marketing and Customer Acquisition. Table 301 Bistro – Website Development | ASTRALCOM – Content Strategy, Conversion Marketing and Customer Acquisition. Table 301 selected ASTRALCOM for their website design and digital marketing based on a long-standing successful business relationship between Table 301 co-owner Dave Solzman and ASTRALCOM, on several previous restaurant and food service-related projects. “ASTRALCOM takes the anxiety out of the process,” said Mr. Solzman. “Every project I’ve done with the ASTRALCOM team has been a rewarding experience,” he added. “We’re extremely happy that Dave continues to trust ASTRALCOM as his digital marketing partner,” said Richard Bergér, VP at ASTRALCOM. “I think it’s testimony to how we do our job; how we treat our clients’ projects as if they were our own,” added Bergér. 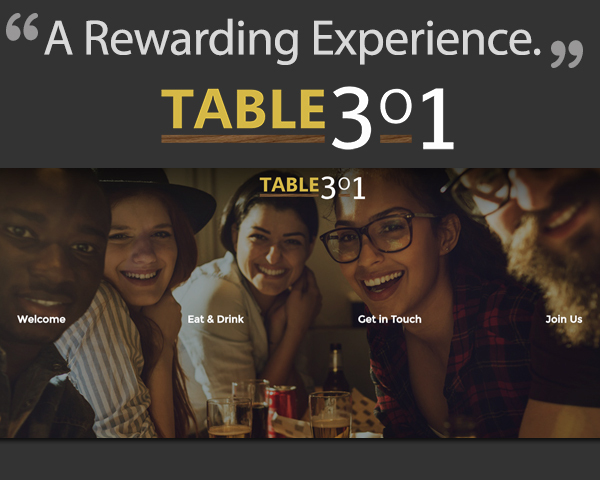 While clearly geared towards a modern audience, the new Table 301 website loads quickly, is user-friendly, incorporates a full menu and its responsive design looks great on all device displays. It’s also easily editable by Table 301 staff. Now that the website is launched, it’s on to digital marketing to help create new customer relationships for Table 301. Be like Dave. Work with ASTRALCOM on your projects and enjoy a rewarding experience, too!